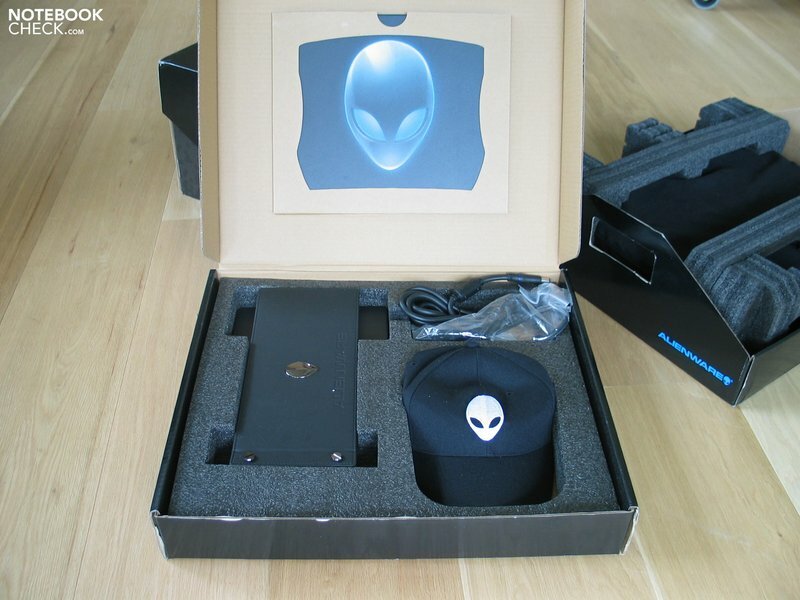 The announced takeover of Alienware by Dell was accompanied with hopes, as well as fears, in the gamer community. It was hoped that the devices would hereafter take a step towards Dell's standards in view of workmanship and case quality. 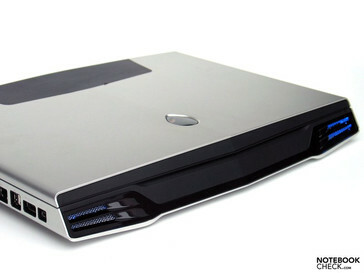 At the same time, it was also feared that the once uncompromising performance-orientation would suffer enormously under the cost pressure, as Alienware was to replace the XPS series from now on. Read our first test impressions here. Probably one of the greatest weaknesses of the hitherto existing Alien models was the case. Certainly, it was always esteemed to use an innovative and optically effective exterior, but the quality of workmanship and material impression had never been the best. Dell had announced radical amendments in advance, in reference to this. In fact, already after handling the notebook for a few seconds, this intention can be confirmed. 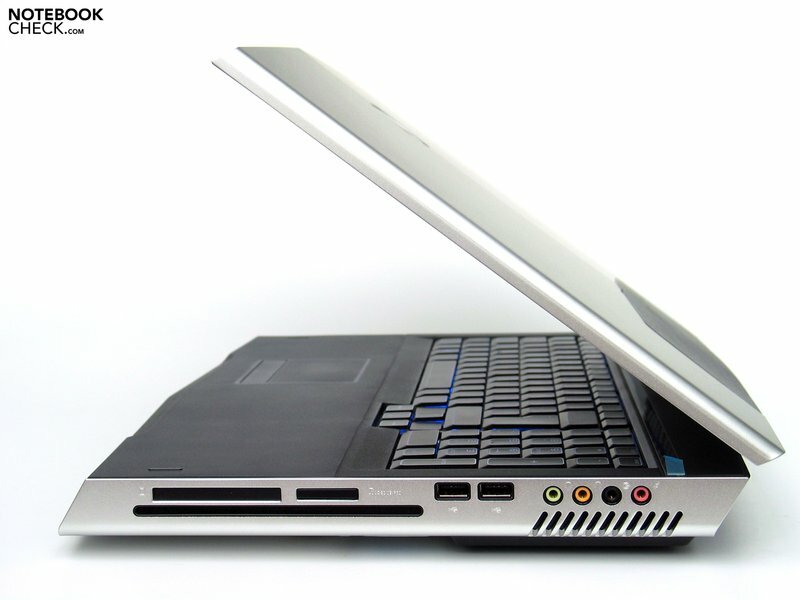 The notebook received a robust case tray made of a 2 – 3 millimeters thick aluminum sheet and the display lid has also been stabilized in this manner. The success validates Dell. The notebook is practically indifferent to pressure and possible torsion. 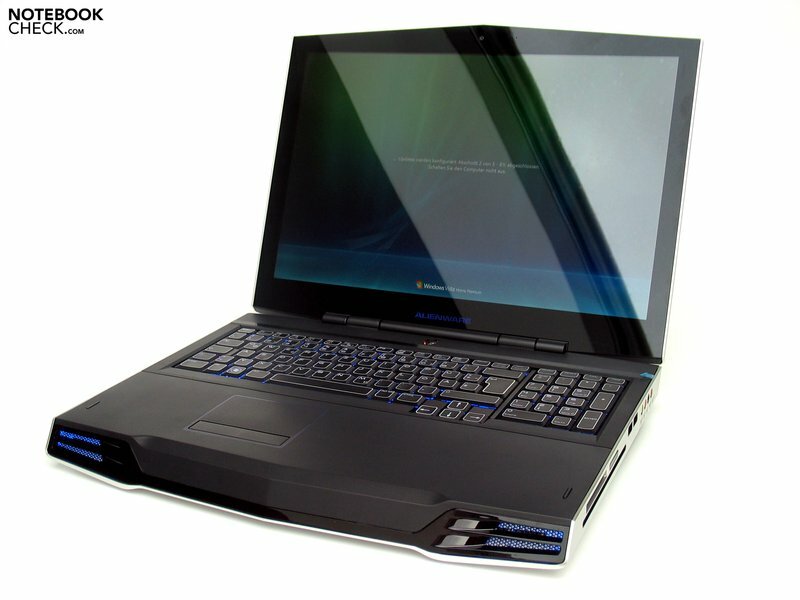 In view of quality impression, Alienware moves in the spheres of Dell's Precision Business notebooks. 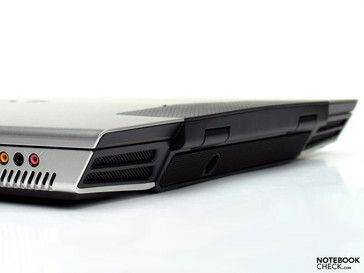 Dell used both lateral edges for the port arrangement. The front side is simply too important to design for implementing single ports here. 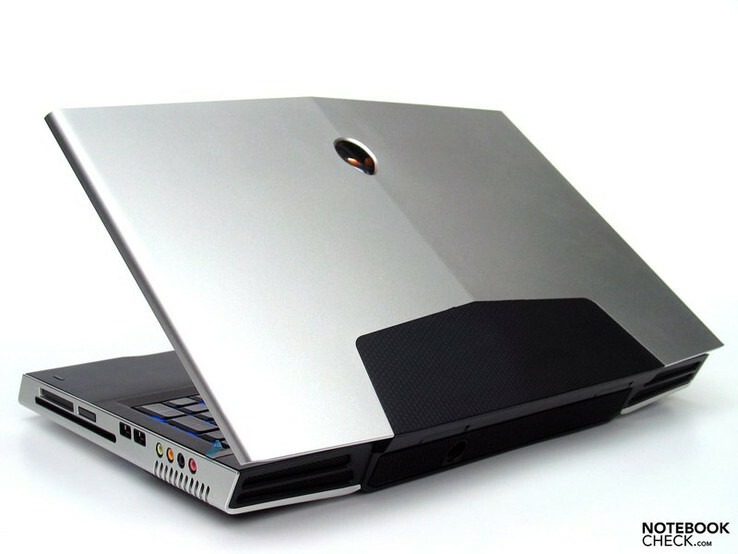 Merely the power supply has been placed on the device's back side, which is almost completely perforated in order to grant the best possible cooling. The left side edge bids - unfortunately more in the front area and therefore unfavorable for lefties – a VGA, an HDMI and a display port, LAN, 2x USB, eSATA and firewire ports. 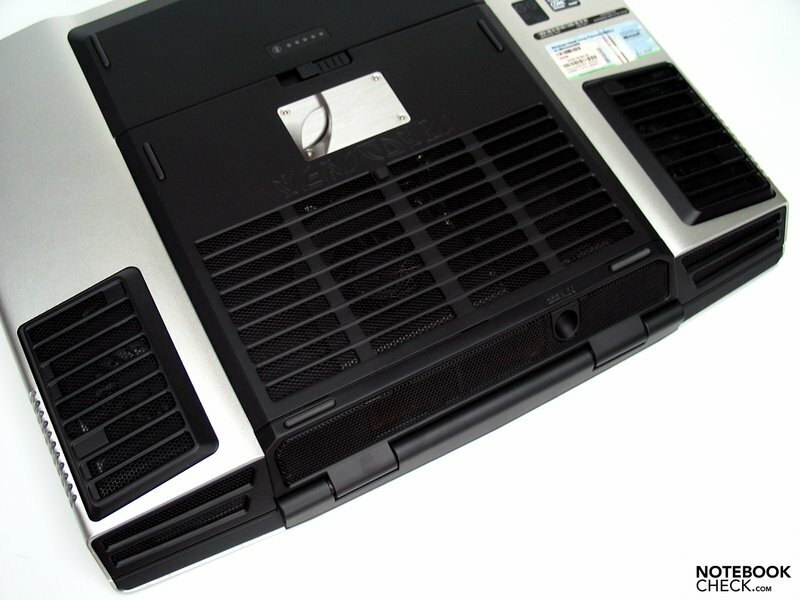 On the opposite side edge, the righty can take delight in a slot-in drive, positioned in the front half, and an ExpressCard and cardreader slot placed above this. Two further USB ports and all audio sockets follow. The implemented keyboard unit remains in the typical Alienware design. There has obviously been nothing altered in the lettering, nor in the look of the keyboard. The back lit keyboard unit and the touchpad are also once again part of the assemblage, which provide for an impressive light spectacle in dimmed surroundings. 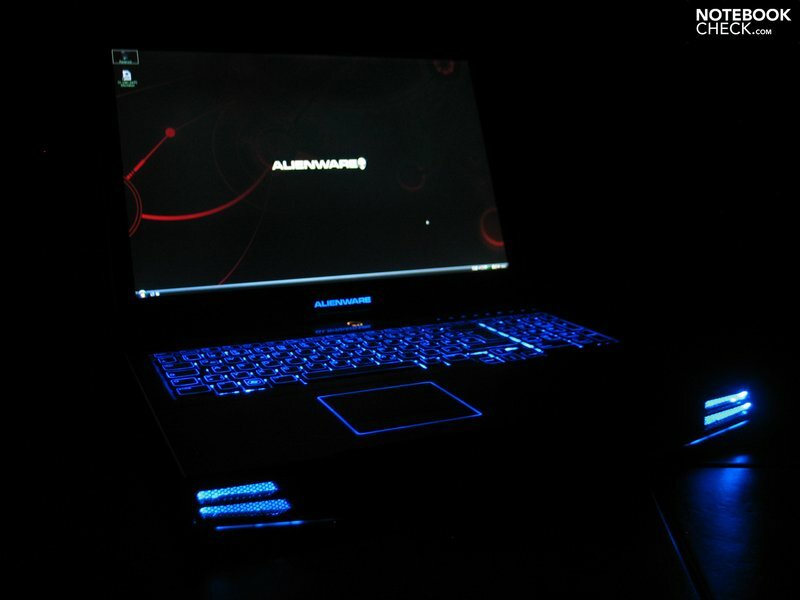 Talking about light shows: With the seasoned Alien-FX tool, you can regulate the colors of the single LEDs to your heart's delight and adjust the notebook to your personal preferences. In view of the type feeling, the keyboard can be described as being soft with a somewhat indistinct pressure point. 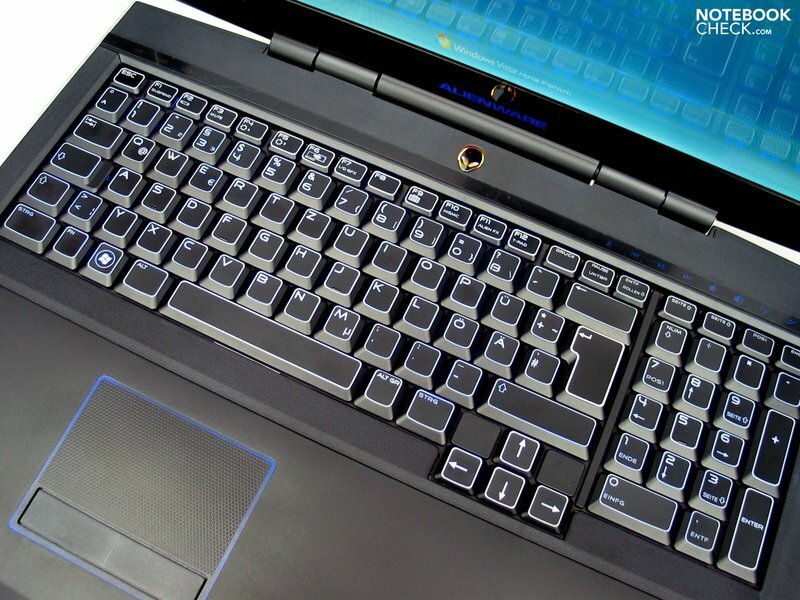 The keyboard bends to a part, which leads to a recoiling of the keys. The layout can be noted as generous and therefore gaming suitable in any case. This applies to the standard keys as well as the slightly offset arrow keys and to the additionally offered numerical block. In the first test, the base unit's form also made a positive impression. Due to the beveled front edge, the keyboard could be used pleasantly despite the proud case height short of 40 millimeters. The touchpad couldn't really convince us at our first tries. The structured surface might have good gliding traits, but the responsiveness is nevertheless to be described as most needy of getting used to. The comparatively stiff touchpad keys don't help in this regard, either. Positive: The touchpad is deactivated automatically as soon as an external mouse is connected to the notebook. A 17 inch screen in WUXGA format with a maximum resolution of 1920x1200 pixels has been implemented in our test model. Only displays with a reflective glare surface are available. The "edge-to-edge" design also correlates to the common trend in high-quality multimedia notebooks. 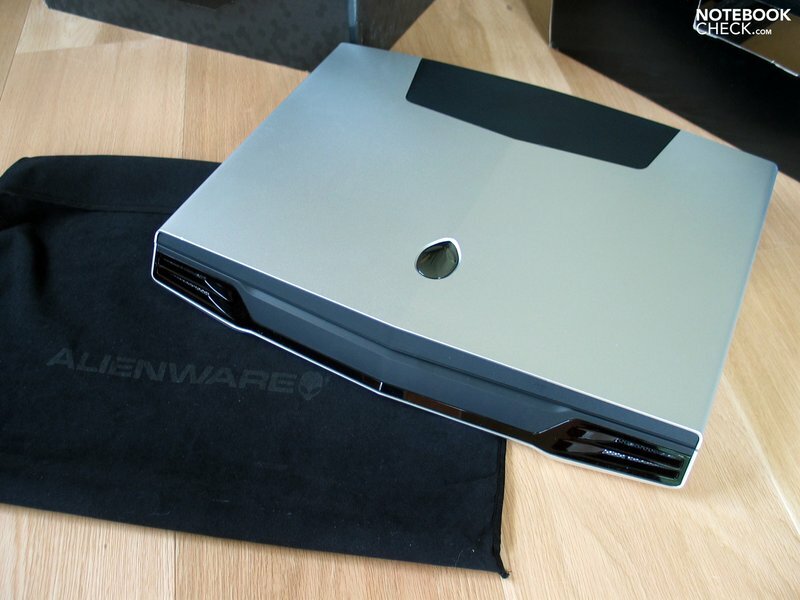 You have to depart from the optionally available matt display variants as Alienware had formerly had in its program. Regrettably. A WXGA+ display with a lower resolution of 1440x900 pixels will optionally be available, but which will come rather more in consideration for the lower-priced configurations. Our first brightness test of the notebook revealed a maximum brightness of 263 cd/m2 in the lower central measuring quadrant. However, we could establish considerable a brightness reduction in the upper corner areas with the naked eye, which was also confirmed by our measurements. The maximum brightness decreased down to 159.5 cd/m2. The value of the brightness distribution is according: The WUXGA screen merely achieved 60.6% in this exercise. The viewing angle stability can be noted as sufficient in the horizontal and vertical aspect ratio. You have to chum up with possible reflections and mirroring, which also turn up indoors, in the long run. As already announced in a preliminary report, Alienware will initially launch the M17x exclusively with components from Intel and Nvidia onto the market. However, implementations of AMD/ATI graphic chips are thinkable in succession. Currently, processors from the Intel Quad-Core range can be chosen from. You can find our extensive test of all available chips here. The most efficient CPU of the model range is applied with the Intel Core Extreme QX9300 CPU, straightaway. 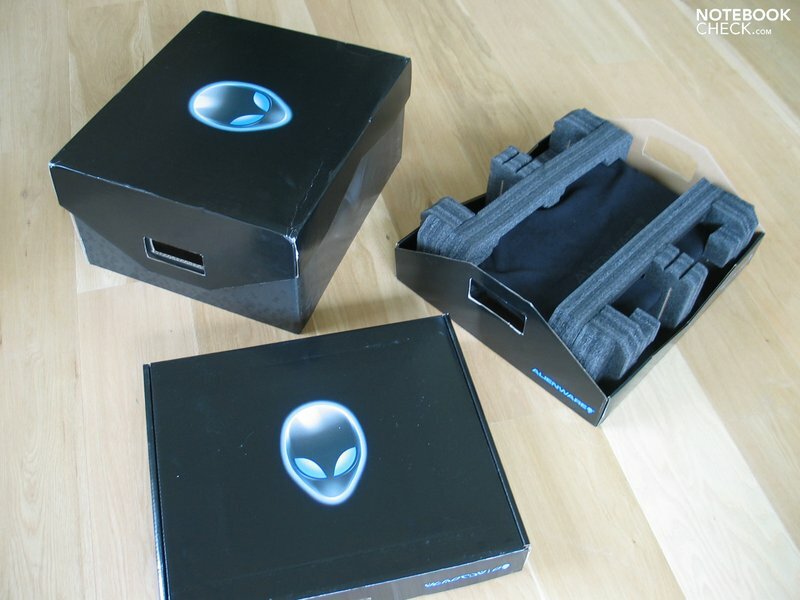 As stated, Alienware keeps its promise, and makes an overclocking of the extreme CPU to a full 3.06 GHz possible – and the best thing about it: It's completely supported by the manufacturer, this being the full warranty claim. 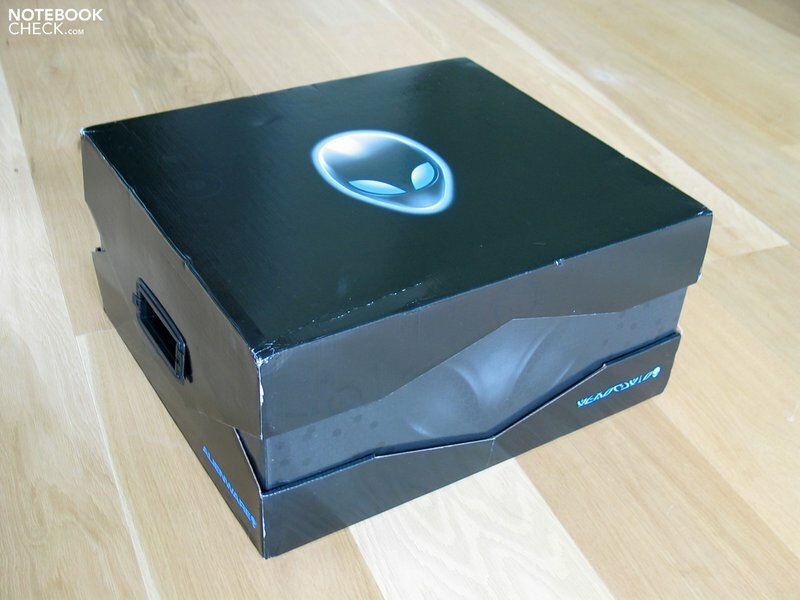 In regards to the graphic chips, Alienware unfortunately restricts themselves to only two models from Nvidia: GTX 260M and GTX 280M. The GTX280M will also be available in SLI crossfire. Our test sample had a single 280M chip. Our system reached an excellent 15378 points in the first test with 3DMark2006. Detailed gaming tests will follow. A special feature of the new M17x is the built-in Nvidia 9400M G chip set. This makes it possible to switch between the dedicated GTX 280M graphic card and the integrated graphic chip set. This worked beautifully in the first test and the change was executed within seconds. Not only can energy be saved, but the device's heat dissipation can also be reduced considerably, which also affects the device's system noise, at low performance requirements. 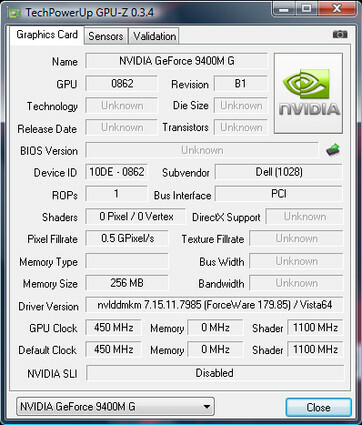 Speculations in view of the later use of ATI graphic card naturally are directly dependent on the applied chip set. 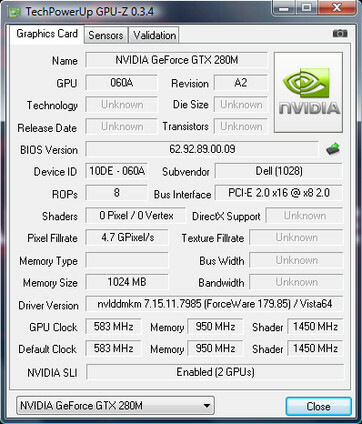 The current Nvidia chip set only supports single ATI graphic cards, such as the Mobility Radeon HD 4850 or the HD 4870, but not in combination (crossfire). And now we come to the next point: The soundscape of the M17x. 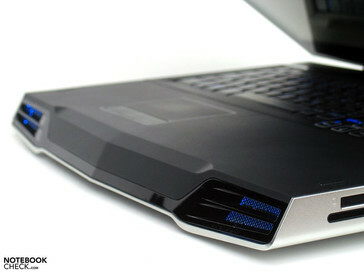 Dell/Alienware precedingly also stated interesting concepts in regards to cooling. Now that the device is facing us, it becomes quickly obvious how this works. The entire back part of the bottom side is made of a fine steel mesh, which grants optimal component ventilation. The first subjective impression confirms this concept. 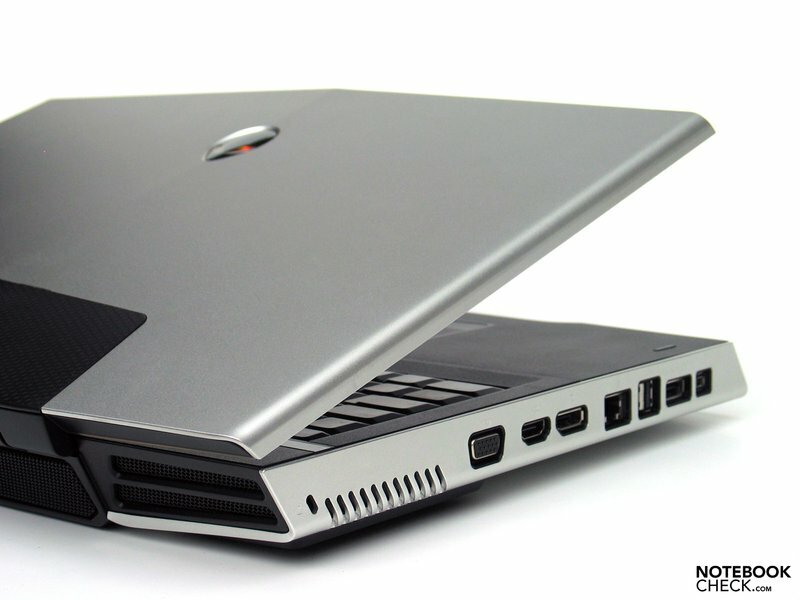 The notebook can be called very quiet with the activated 9400M G graphic in idle and office mode. Merely a discreet whirring of the fan is audible. 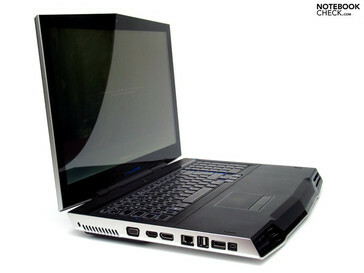 Therefore, a relaxing surfing in a quiet surrounding is no problem for the notebook. But even with an activated GTX 280M graphic, the noise level remains surprisingly low and absolutely within a limit. To start with, the base unit's upper side only warms up slightly in the first operating hours, subjectively. More exact results will follow after the executed stress tests and comprehensive gaming use. The built-in speakers are probably only behind the lighted openings in the front edge. The first impression of the given sound quality is very positive. The sound can be described as existent with sufficient amplitude and an acceptable maximum possible volume. Thumbs up – that's our first impression of the new Alienware M17x gaming notebook. The declared improvements in regards to the case have been carried out and exceed our expectations by far. The appearance can also be called absolutely well-executed. The applied display may show a few weaknesses in regards to illumination, the brightness as well as the given contrast is alright. Details about the color representation of the used screen will follow, but the first subjective impression turns out positive, though. Hopes for a first-class gaming are aroused by the exceptionally good results in the 3DMark2006 benchmark test. Details about how the notebook performs in single contemporary games in the practical test will also follow. The system base from Nvidia, the 9400M G chip set, could also convince, which allows the change of the graphics "on the fly" and additionally makes a pleasantly quiet notebook operation possible, if the given performance reserves aren't required for a while. You will find a review in the usual circumference, including extensive gaming tests and measurements. Stay tuned!